Accessory: Manual Change, Back Stop Device Dies:10,13,16,19,22,26,30,39,45. 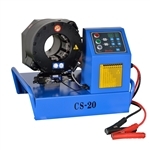 Whether you have a small workshop in your home or you are looking to add a hose crimper to your small business, Hose and Fitting Supply has a variety of options for you to choose from. Finding the right hydraulic hose fitting crimper can often feel confusing. What size do you need? How many fittings? Does it need to be portable? Whatever the question, we want to help you find the best hydraulic hose crimper for your needs. Start by exploring our options and if you have any questions along the way, please contact us! 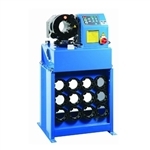 Hose and Fitting Supply offers a wide variety of hydraulic hose crimpers for sale. With quality products and competitive prices, you are sure to get a great deal by shopping online. Get your new hose crimper delivered to your doorstep or worksite by ordering online. Need additional supplies? Browse our vast line of supplies and visit our home page to view special discount information on bulk orders!